Who ever said children weren’t very wise? My son has figured out how to get what he desires through my cookbooks. After I quickly appeased his request for the Baked Banana Doughnuts, he was obviously back in the same book looking for something else to satisfy his cravings. I found this note on my desk this morning next to the recipe for these cookies. It cracked me up. I guess it is one way to get your oatmeal. He thinks like me. How could I not make them. He’s very lucky I keep a very stocked baking pantry. They were ready when he came home from school. He was happy. It makes me wonder what will be next. I hope it’s lobster. Beat butter, brown sugar and granulated sugar in a bowl until creamy. Add eggs and vanilla; beat well. Combine flour, baking soda, salt and cinnamon; add to butter mixture, beating well. 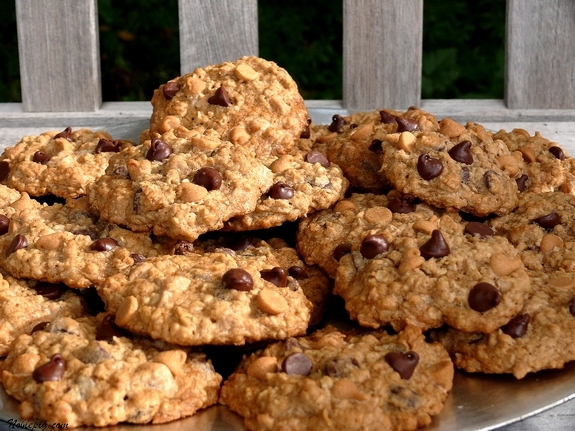 Stir in oats, milk chocolate chips and peanut butter chips. Drop by rounded teaspoons onto ungreased cookie sheet. Bake in a 350 degree oven for 10 to 14 minutes or until lightly browned. Cool for 1 minute and move to a wire rack. The little bit of cinnamon in these cookies makes for a nice flavor. Thank goodness it’s the weekend, I can’t be alone in the house with these. Oh my word that is hysterical! What a smartie, I want them too!!! Kids know how to get what they want. Very smart way to ‘trick’ you. Please tell your son I said thank you from the bottom of Phil’s heart…he will love them! these are my dream come true. yum. Your son has lovely handwriting! I don’t do well at making cookies, because I can never make enough to satisfy the hungry hordes. Please feel free to drop by with cookies when you are in the neighborhood! Not only is he very smart but your son also has great handwriting. Love it! Those look so good–your son obviously has excellent taste! I made the banana doughnuts yesterday and they were a big hit!! He knows his mama! These are addictive looking cookies..I couldn’t be left alone with them! How cute that he left a note! I wonder if my daughter will be doing something like that when she learns to write better. The cookies look scrumptious! What a riot that kid is. These will be coming to my house soon. Very high on the yum factor. How cute is that! These cookies are so tempting. Perfect way to get your oatmeal in! smart kid! 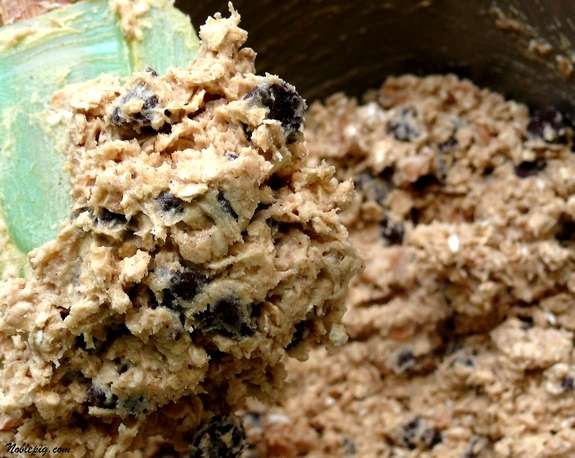 i don’t like oatmeal-raisin cookies (well, as much as a person can not like a cookie, anyway)(i’ll still eat them, of course), so this would have to be my ideal way to get my oatmeal intake. studly studded cookies, cathy! Peanut butter? Chocolate chips? OATMEAL?!? I am so making these. Ha! That’s great. Well played, kid. They look awesome, a great combo. Your son really knows how to get cookies, doesn’t he? What a smart little bugger he is! 2–smart kid, funny, too. I love it. 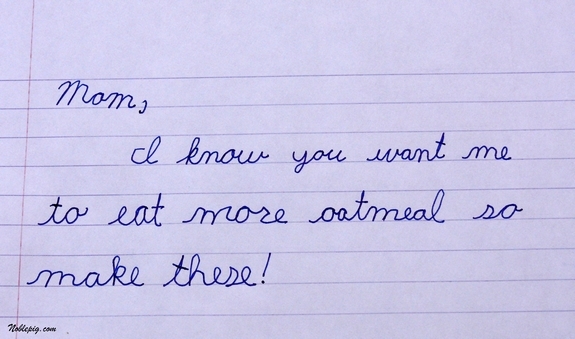 3–Great handwriting–and cursive to boot! 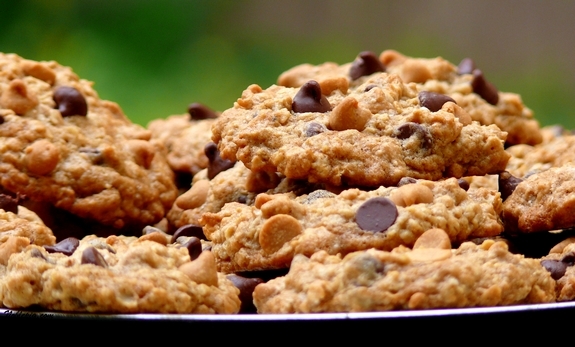 you know you have a smart kid there– he will eat more oatmeal in a cookie shape form, smart. Wow! How old is your son? That is the best handwriting and spelling I’ve ever seen out of a boy that young. I’d say your son is pretty smart, and has excellent taste. And great handwriting to boot! These look delicious =D. 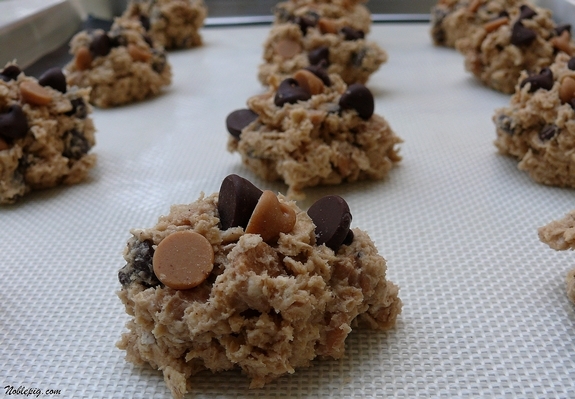 I love the idea of peanut butter chips – they sound like a great way to change up a chocolate chip cookie! That’s so cute he wrote a request! I couldn’t be alone with them either! I think it is very cute that they are sending you notes to bake for them now! Thanks for the idea about the banana donuts. I have a donut pan so when I made banana bread the other night I poured some batter in the pan for a few donuts for the kids’ lunches, they loved them. Now I have a use for that pan- it only makes 12 minis though! That is funny! I would like to be a kid and live at your house!!! That is one smart boy you’ve got there! How funny is he?! These look so yummy! I really want to make these and the banana donuts! Made these with my little boys this morning and I am sure we will all get in a serving of oatmeal today! Wonderful, thanks for sharing! “I hope its lobster”! You crack me up. Him too-that is a good way to ask for something! Your cookies look really cute with the chips studded on top. These look delicious! These look phenomenal! I am really craving chocolate lately. I wouldn’t mind a few of these for a late night night snack….or breakfast. Ok, I’m actually someone who prefers savory over sweet – but I was just browsing your recent recipes and these look sooo yummy! I’m going to check my pantry to see if I have this stuff – mu husband will be extremely pleased!